After a week of training for work that left me without a refridgerator, freezer, and microwave for a week…I was ready for some new, healthy items to take with me to work next week. As much as I adore Fiber One bars, I’m getting sick of them…and as much as I love string cheese, I’m also getting sick of it. 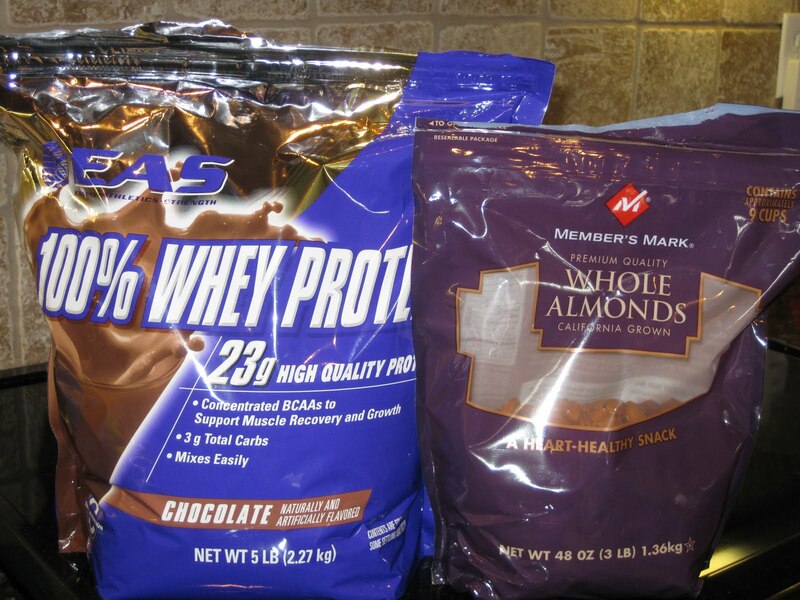 On our Sam’s Club run today, I got a little protein crazy: unsalted almonds and EAS Whey Protein Powder. I came home and put into baggies individual portions of each. Why these foods? They’re healthy, of course. 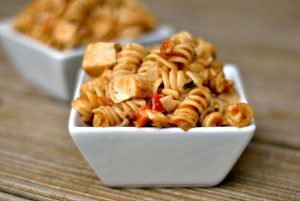 Protein tends to be much more filling than carbohydrates alone, which many snack foods are. Almonds are high in fiber, vitamin E, magnesium, copper, and several other phytochemicals. Almonds are also heart-healthy and contain high levels of antioxidants. Nutrition nerds, you may want to go here and read about Oxygen Radical Absorption Capacity (ORAC) — it’s interesting stuff! There’s new research showing prebiotic effects of almonds, aiding in immunity and proper gut function. 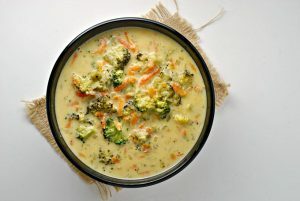 They are, however, high in calories (160 calories an ounce), as they contain 13 grams of mono and polyunsaturated fatty acids (the good stuff!). 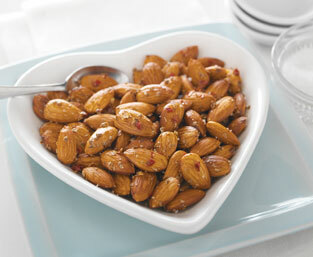 A recommended serving of almonds is 3 tablespoons, one ounce, or 23 almonds to be exact! Above all tree nuts, almonds are highest in protein, fiber, calcium, vitamin E, riboflavin, and niacin. And what’s the deal with this EAS Whey protein powder? Well, firstly, it’s made by Abbott Nutrition. This tells me that 1) it’s quality-controlled, and 2) it’s the real deal. 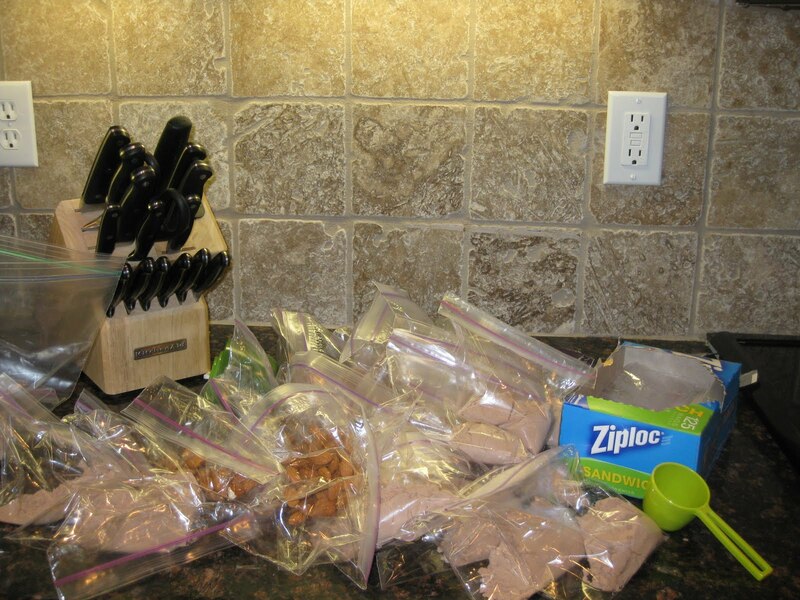 You can find prepared and individually packaged EAS protein drinks for around $2 each. ::jaw hits the floor:: (I know). The 76-serving package from Sam’s Club, however, was $29.95 — $0.34 a serving. Talk about savings…props, self. So you just add the protein powder to cold water, and for a mere 130 calories, you’re consuming 23 grams of high-quality protein. The biological value of the EAS whey is 104 (egg protein being 100, the gold standard of BV). The protein digestability (PD) score of the EAS is 100 — the same as casein and milk proteins with the net protein utilization* (NPU) coming in at 92 — higher than both casein (76) and milk protein (45-86). It’ll be a great thing to have at work for after my lunch break workouts and to stave off hunger during the afternoon hours. « Study says: saccharin's alright. Oxygen radical absorption capacity, eh? That's new to me, thanks for the information! I'm a huge almond fan, I add it to my granola and my ice cream. I'm curious about something, are you a vegetarian? If not, why do you think you need 24 grams of protein from your snack? I don't understand why you would want all that protein, unless you aren't getting enough protein from other sources. Please explain, as I've heard others say that too (but since you're an RD I thought maybe you would explain it better). I know protein is good for muscles and for preventing sore muscles, but that's a lot!